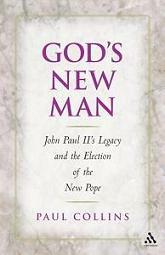 I have just put down Paul Collins’ new book, God’s New Man: The Election of Benedict XVI and the Legacy of John Paul II (Carlton: Melbourne University Press, 2005). It’s a very readable and engaging narrative about John Paul II and the rise of Ratzinger, and it also contains a good deal of informed theological discussion. I was especially interested in the account of Ratzinger’s development in the 60s and 70s, and in the comments on his theological relationship to contemporaries like John Paul II, Karl Rahner, Hans Urs von Balthasar, Hans Küng, and the liberation theologians. If you’re interested in the new pope’s biographical and theological background, then this book is well worth checking out.